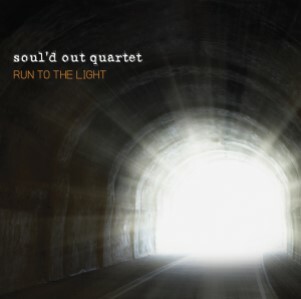 Today, we take a look at the latest album from Soul’d Out Quartet; Run To The Light. Run To The Light is the first album of new music from the group since 2014 (Great Life). With the addition of Jason McAtee at lead, Soul’d Out’s sound has shifted to a blues/pop infused Southern Gospel style. Jason has a vocal comparative to Russ Taff. The 2018 edition of Soul’d Out Quartet is composed of Dusty Barrett (tenor), Jason McAtee (lead), Matt Rankin (baritone) and Ian Owens (bass). Group owner/manager, Matt Rankin, remains the resident songwriter of the group having contributed to 8 of the 10 songs on the recording. The stand out track is the album’s first single, “The Return”. This triumphant ballad is the most Southern Gospel friendly song on Run To The Light. Another ballad that could find a home at Southern Gospel radio is the album’s closing number, “Hallelujah What A Savior”. Matt and Jason trade verses. The closest Southern Gospel quartet style song is the up-tempo Matt feature, “That Wonderful Day”. This song was originally recorded by the group in 2009 (Blessed). Bass vocalist, Ian Owens, gets one feature that deserves a listen; “Jesus Is My Best Friend”. The mid-tempo tune has a bit of a blues feel. A fun song that should go over well on the concert stage. As mentioned in the synopsis, lead vocalist Jason McAtee’s raspy vocal lends to some southern rock moments as is evidenced of the group’s cover of “Water Grave”. I’ve never been a fan of the song but the southern rock arrangement given the song makes it the best rendition of the song I’ve heard. Don’t want to leave the review without mentioning the tenor vocals of Dusty Barrett. Always considered Dusty one of the most underrated tenors in Southern Gospel music. Give “Heaven” a listen. Strongest songs included in order: “The Return”, “Hallelujah What A Savior”, “Jesus Is My Best Friend”, “Heaven”, “Water Grave” and “Next To A Holy God”. While I enjoyed the southern rock vibes given to “Water Grave”, “I Will Do The Same” came off as something heard every Sunday in the big box church. Some long time listeners of the group may be taken back by some of the stylistic choices made on Run To The Light. Weakest songs included in order: “Lord Take This Life” and “I Will Do The Same”. New vocal members sometimes bring vocal changes to a group, if for nothing else but their voice. That occurred with Soul’d Out Quartet when Jason McAtee was brought on board. Run To The Light is the first in what I hope to be more recordings from this vocal line-up. I really like this group, and live they’re tremendous. They’re here to stay. I just watched them on Guy Penrod’s show. I’ve been aware of them for years but nothing had really impressed me, but they were great on the show. The lead is ironically of Guy Penrod caliber vocally—range and tone, with more soul. The tenor is way better than most. The other two guys are great too. Though it’s cool to have this, I’d say their one hold up as is often in groups with in house songwriters is using too many of one writer’s songs. Even if that writer was Bill Gaither, it kinda limits them musically. That being said, this guy is a good writer.